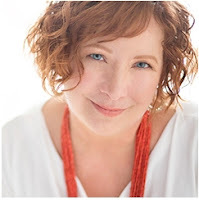 Today I have the pleasure of hosting a stop on another Great Escapes tour and giveaway, for a fun sea-going mystery! Orphans. Thieves. Murder. And an All-You-Can-Eat Buffet! 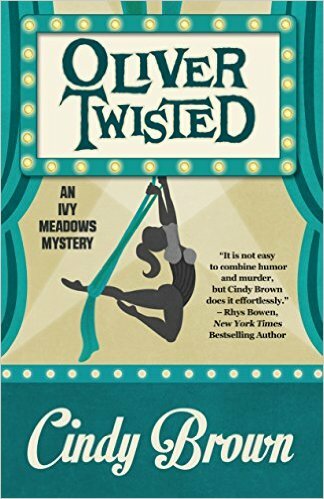 When Ivy Meadows lands a gig with the book-themed cruise line Get Lit!, she thinks she’s died and gone to Broadway. Not only has she snagged a starring role in a musical production of Oliver Twist, she’s making bank helping her PI uncle investigate a string of onboard thefts, all while sailing to Hawaii on the S.S. David Copperfield. But Ivy is cruising for disaster. 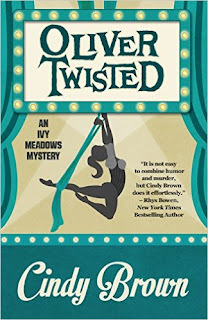 Her acting contract somehow skipped the part about aerial dancing forty feet above the stage, her uncle Bob is seriously sidetracked by a suspicious blonde, and—oh yeah—there’s a corpse in her closet. Forget catching crooks. Ivy’s going to have a Dickens of a time just surviving. I really enjoyed this book! It's been a while since I had a book grab me by the face and insist I read right through, but this one did it. It took only a few pages to get fully engaged, and I felt almost physical pain when I had to put it down 40 pages from the end and go to work. The funny thing: I can't really say just why this book got me, and not the last several I've read. The writing, the characters, and the story just seemed to work for me. I liked Ivy, who shows a good balance of solid work as both detective and actress with just enough metaphorical face-plants to keep her human (more goofs as detective than actress, which makes sense as the former is her new profession). I also liked the mystery. It was complex, and I was unsure who was the perp until very near the end (though there were earlier moments when I fingered the right person, I was always diverted off onto another suspect). The book does a nice job of making you think about family and relationships without making itself into any kind of treatise--these things just matter to the story. The writing is strong and well-edited, though the discussion of "duct/duck tape" is going to send me off to do some research. The Dickens references throughout (well, it *is* a Dickens cruise) add an element of fun as well as forcing me to dredge up memories of books long past. I admit to remembering the musical Oliver! quite a lot better than the book Oliver Twist. In fact, the least real thing in this book, in my opinion, was Ivy's ability to skim quickly through a Dickens novel or two. That man used a lot of words! Although this is the 3rd book in the series, it stands alone just fine. I will be going back and reading the first two! A great summer read, not too demanding but not total fluff, either. If you are a Dickens fan you'll get some real bonuses out of it (I've read just enough Dickens to catch a lot of the references, but not all). 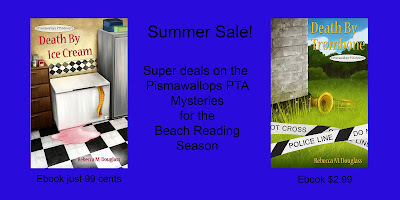 For more summer reading, check out my mysteries, at summer sale prices! Complex is good in a mystery. Great review. Hope you like it, Mary! What a brilliant title. In fact, what an excellent set of titles. I'd love a morsel of her talent, if only for the titles. I know. And the title was the first thing to catch my attention. So well done, Cindy! What a wonderful way to start off launch week. Thanks, Rebecca, for the great review!